Hello dear readers. It's officially Fall! It's casserole and soup season! You have no idea how happy I am for the cooler weather. Being pregnant during the summer was not so fun. I had no appetite and I was not interested in cooking anything in the oven that would make the house hotter than it already was. I think we'll get the AC serviced in the springtime because it's just not cooling anymore. Anyhow, FOOD! I've been hungry for something different than our standard, go-to meals. I had to think back to the old days growing up and what kinds of interesting things we found at church pot-lucks. That brings me to home-cooked Basque food. I perused my old community cookbooks and got some ideas. I perused the Internet for more ideas. Food started flying into the pot on the stove. And then bingo! 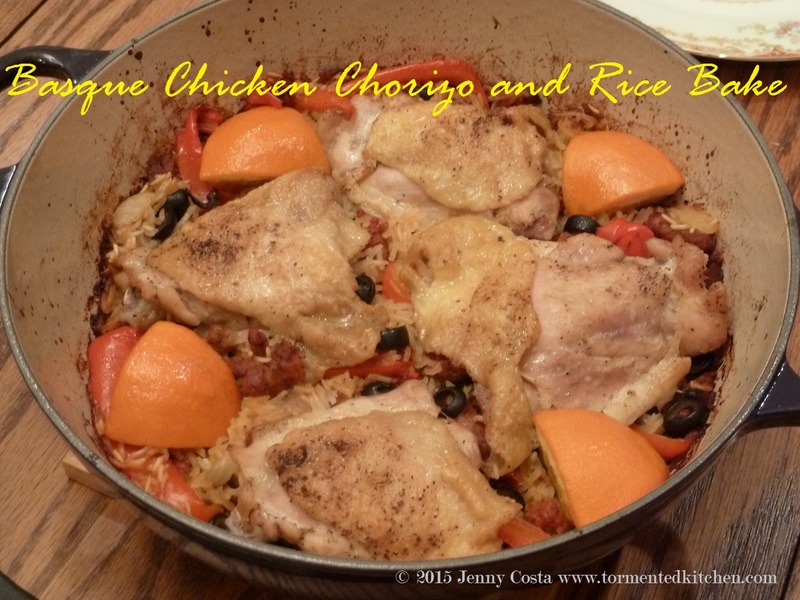 Basque chicken and rice was served. Basically it all started because we took a short road trip back the old hometown to visit Grandma Rose so she could meet the baby. We stopped at the little grocery market a block from her house. 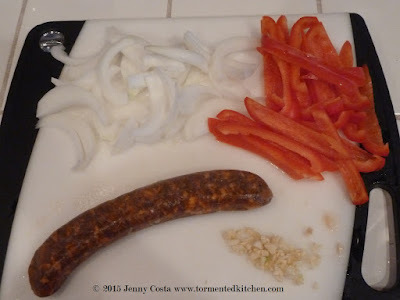 The Husband picked up a package of their house-made chorizo. The chorizo from Uptown Market is a fresh sausage in real pork casing and it's not smoked or cured. One package came with four sausages that are about 7" long. I only used one for this recipe and froze the rest. 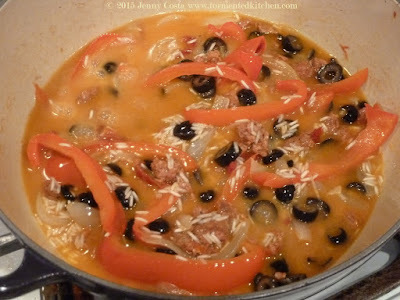 You will need a covered casserole dish or Dutch oven that can go from stove-top to oven to make this a one-pot meal. I used my 4-quart Le Creuset soup pot for this. 1. Season chicken pieces with salt and pepper. Brown in the olive oil. You do not need to cook it all the way through, simply get the outside browned. Remove chicken to a plate for now. Keep all the hot fat in the pot. 2. 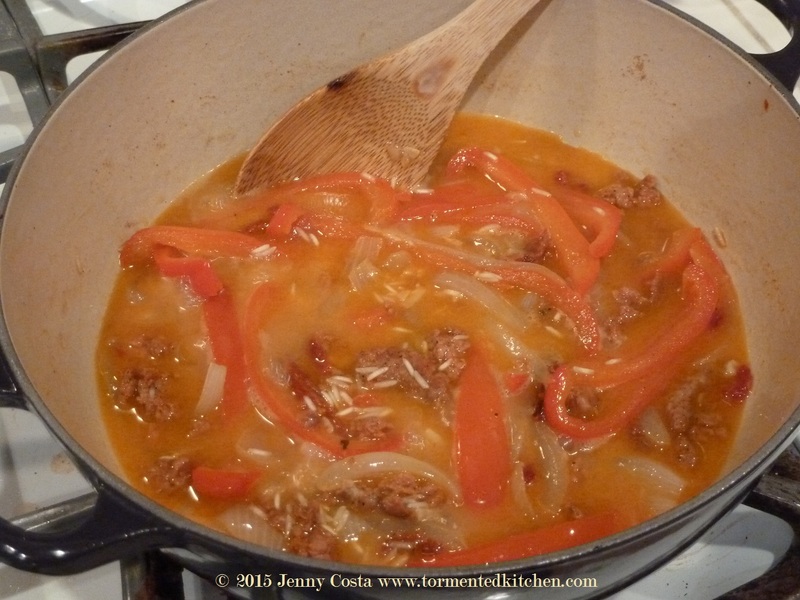 In the same pot, cook the chorizo until it is browned. 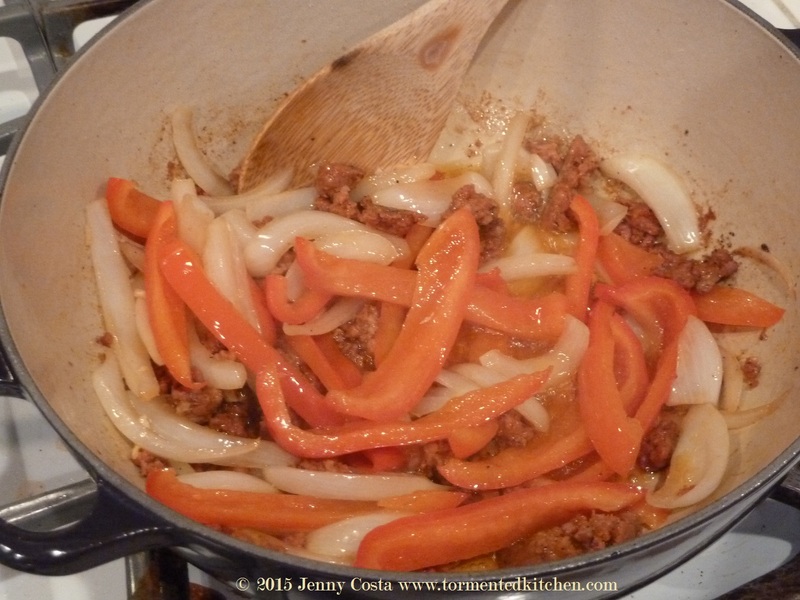 Add the bell pepper and onion and saute until softened. 3. 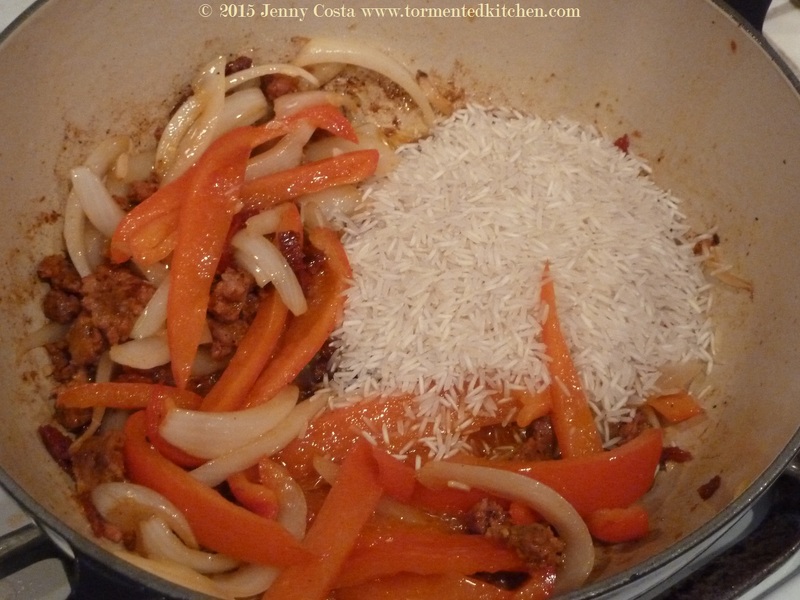 Add the garlic and rice. Stir until the garlic is fragrant and the rice is coated in oil. 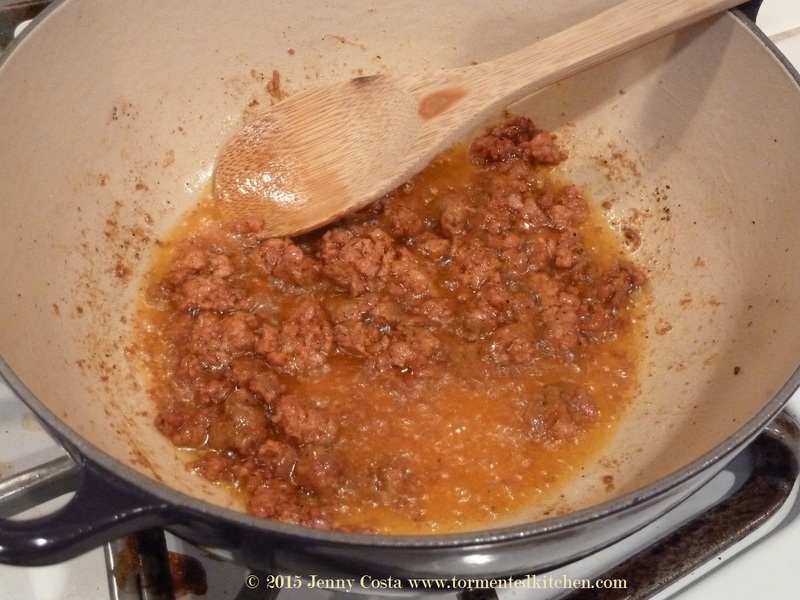 Now add the tomato paste, paprika, and thyme. Stir. 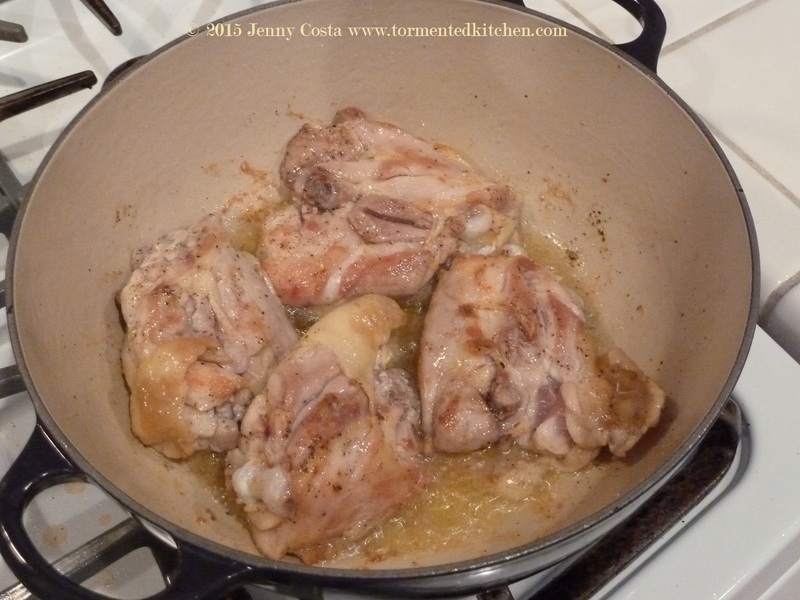 Add the wine and chicken stock. 4. Add the sliced olives and sun-dried tomatoes. Stir well and bring up to a boil. As soon as it boils, turn off the heat. 5. Place the reserved chicken pieces on top. 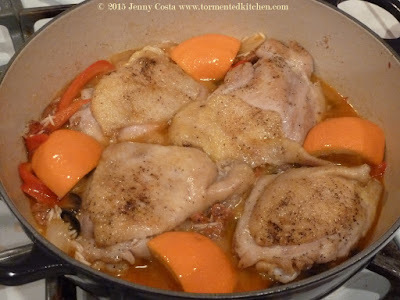 Squeeze the oranges slightly over the chicken and arrange the orange quarters so they are partially submerged in the liquid. 6. Cover and bake 45-60 minutes in a preheated 350F oven. 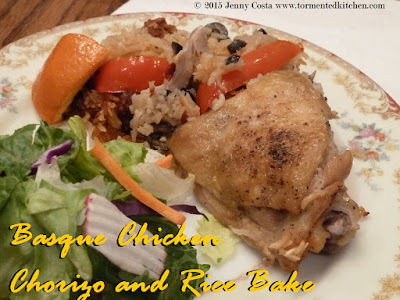 This recipe was adapted from Delia Online's Chicken Basque.